The citywide leaf pick-up program will begin Monday, November 19, 2018. City collection efforts will follow the proposed schedule as closely as possible. The proposed schedule is a general guide and can vary considerably from the actual schedule due to weather conditions and the amount of leaves. 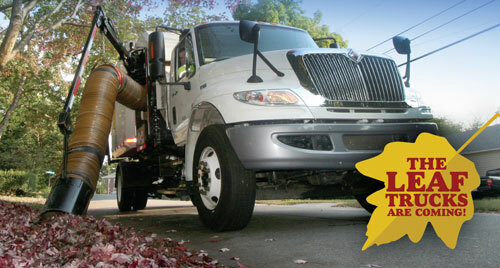 PLEASE NOTE: Streets will be swept approximately two weeks after leaves are picked up in each designated area. Residents should place their leaves near, but not beyond the curb. Leaves must not be placed on the sidewalk or in the street, parking spaces or drainage ditches due to posing a pedestrian or traffic hazard and possibly clogging the storm drains. Hazards that are created by improperly placed leaves will be removed by the City at the resident's expense. Leaves must be free of tree branches and twigs as these can cause the leaf vacuums to clog. Because of their impact on production, leaf piles found to contain these items will not be picked up. All leaves must be placed outside fenced areas. If there is no other location on your property to rake your leaves, then rake them to the end or side of your driveway. Leaves may be placed in plastic bags and will be picked up at the curb during the scheduled program. Only leaves will be collected during this fall's program. Citizens are reminded that the citywide household trash and brush pick-up will be scheduled in April and May. For more information, please contact Waste Connections of Tennessee at (865) 482-3656.